Port of Seattle staff listen and respond to questions and comments during the SAMP open house presentation at the Georgetown branch of South Seattle College. Sea-Tac Airport is planing to grow. In an effort to meet future regional demand, the Port of Seattle has come out with the Sea-Tac Airport Master Plan (SAMP), which outlines an extensive growth process. By 2027, Sea-Tac will service 56 million passengers -- up from 45.7 currently. On Thursday evening, the Port held an open house and presentation for community members to review the plan and ask questions. 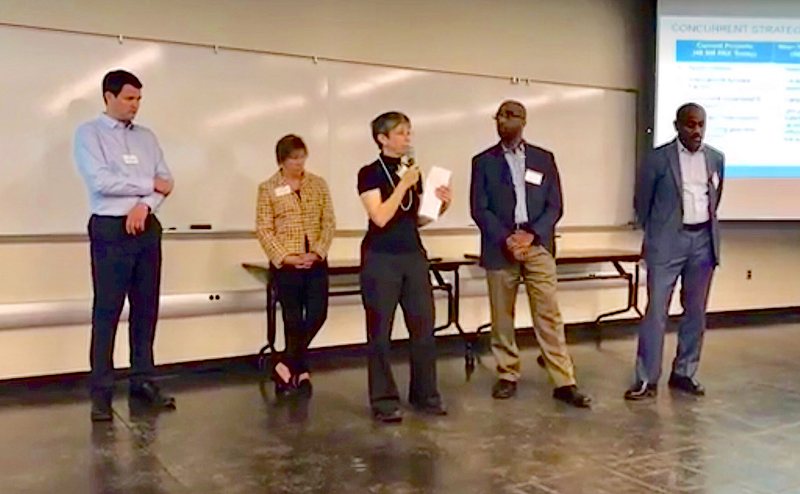 The meeting -- held at Georgetown campus of South Seattle College -- was the second SAMP community meeting (the first was held in SeaTac). The final community meeting is set for Bellevue on June 20. Read our previous coverage here. Of particular concern to neighbors so far is how the plan will significantly increase noise and pollution, especially for people who live nearby. However, Perry Cooper, spokesperson at Port of Seattle said on Thursday that the Port is zeroing in on the possible fallouts of expansion by intensively focusing on "sustainability" and listening to neighbors' comments. "We're the first airport in the country to actually include the term 'sustainability' as one of our tenants of our master plan," he said. Cooper explained how the Port has been asking itself questions: "What are the impacts to our communities and those around us?" he said. "How do we make that balance of what's coming... and how are we going to manage that as we go into the future?" Cooper noted that Sea-Tac has been a leader among airports in its environmentally-friendly efforts. Sea-Tac's SAMP plan will work in two phases. The first phase recommends more than 30 projects that will improve efficiency, safety, access to the airport and support facilities for airlines, according to the Port. Highlights of the first phase include a new terminal with 19 gates, and an automated people mover with three stations to connect the rental car facility, new terminal and main terminal. Near-term projects will accommodate 56 million passengers and meet forecasted demand to 2027. Near-term projects will be complete or under construction by 2027. The Port will then participate in a broader conversation, as well as review results from a new regional aviation study. Long-term recommendations will be made at that time. For more details on SAMP, visit the Port's website. If you'd like to receive email updates about SAMP, you can sign up here and select Sustainable Airport Master Plan. Visit the our West Seattle Herald Facebook page for live coverage of the Port's Thursday community meeting. I was at this meeting. Their use of the word sustainability continues to completely ignore their utter destruction of community fabric, huge monetary losses to local residents (the vast majority of whom of whom are NOT supported by Seatac), and that they are killing people (sleep harm, noise health impacts, cardiovascular damage, mental health damage, lung damage, cancer, list is longer) and greatly harming their quality of life. At best it’s greenwashing (biofuels, electric vehicles,etc) but it’s really just lying. Sustainability is an improperly-hijacked term to try to sprinkle holy water on their devastations of lives. The airport stopped being sustainable decades ago (that’s why they moved Hong Kong’s and Denver’s airports out of the urbanized area well before they hit 30 million passengers a year). ^^ Move away from the airport if you don't like it. SeaTac has been there since WWII and Boeing Field since the 20s. You are not a victim - accept responsibility for your own decisions. Just flew in and out of SeaTac over the weekend. What a mess! I've always thought highly of this airport and how well it has been run. Today was a traveler's nightmare with lines so long it took 45 minutes to get to the security lines and then an additional 15 to get through security. I hardly recognized the place. Wasn't this bad a month ago. Allow 3 hours minimum if you fly out of there. I had two and barely made it! UGH! "Move away from the airport", Jimmi Joess? I live in Shoreline, 25 miles from Sea-Tac, and we have jet aircraft overhead every 30 to 60 seconds for hours at a time, day and night, seven days a week. Where exactly are people supposed to move to?